"He [Bush] is the worst President in all of American history"
"Enlightened changes in your foreign and domestic policies will do more to prevent terrorism and social problems than any 'wars' or 'homeland security' measures." deception As usual, I am confused and who is not? President Bush's claim to fight terrorism under the crusading slogan "either with us or against us" wraps up the mastery of deception of all the tough policy and management decision makers of our world wide crony capitalism. attack Bush wants to attack Iraq, but why? Iraq First he says he wants a regime change, then he says that Iraq has weapons of mass destruction, and now he says that Iraq has links with Al Qaeda. In the meantime some 200,000 American and British troops are being assembled in the Gulf region to deliver a possible surgical military operation including the launching of some 800 cruise missiles against Baghdad in one single day along with the 'securing' of Iraqi oil fields. Is this the way to liberate the Iraqi people? peace American troops are stationed all over the world to maintain peace, but strangely enough American troops are mostly stationed for the securing of oil while all over the world we have civil wars, mutilations, nuclear proliferation, human trafficking, starvation, poverty, spreading of diseases and Aids epidemic. 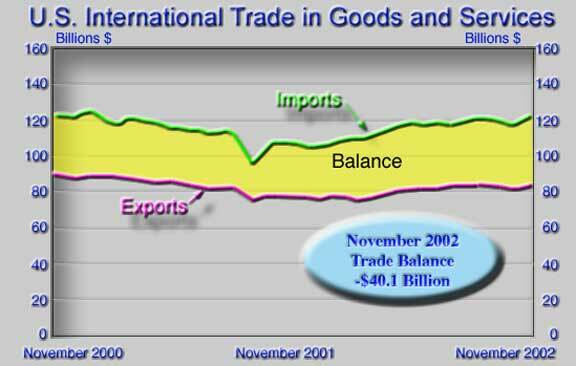 deficit This year's U.S. budget is in the red at the tune of some $300 billion, the chronic U.S. international trade deficit continues as it was in the order of $40 billion for the single month of November 2002. It becomes obvious to me that the American policy of a strong dollar, crony capitalism and the waging of wars are the premises of President Bush's New World Order: a bloody U.S. dollar.